Seems a piece of flap or similar has washed up on Reunion Island. Tweet says the similarities to a 777 part are incredible. Could it be from the Yemenia 313 some years ago? The part looks like a composite flaperon with damage more consistent with a slower speed impact. They should recheck the area surrounding where the pings were heard. There wasn't enough mapping done there. It is highly possible to have a distorted frequency towards the end of battery life. NTSB simulation plots based on Great Circle Track where assuming the FMC would guide the autopilot system to fly. But with the aircraft had made a few turns, most likely the pilots had reverted to MCP direct input to the autopilot system where the track is magnetic be it on TRK SEL or HDG SEL, is subjected to high magnetic variation further down south. Thus, when the magnetic track being plotted would be a curve towards East. But a curve cannot satisfy the handshakes. If the handshakes are correct, this magnetic curve line can be "straighten" by lifting the tail end Northwards while maintaining all the handshakes relationship with the satellite position. Just imagine the capital letter "T" with the handshakes numbering from the left to right, the position of the satellite is at the bottom of the vertical shaft and the letter T has fallen 90 degrees to the your right. Now you have handshake no.6&7 at the right hand bottom, you are lifting the "T" pivoting the bottom of the shaft to the satellite position. Try lift it until no.7 handshake ends up in less than 5 degrees variation. Then you will agree they have been looking too far down all this while. Based on where it is believed that the aircraft came down, and the combined drift / flow of the West Australian Current and the South Equatorial Current, Reunion Island is a reasonably likely place for something to wash up. Will be interested to see if they can match this to the hull number. 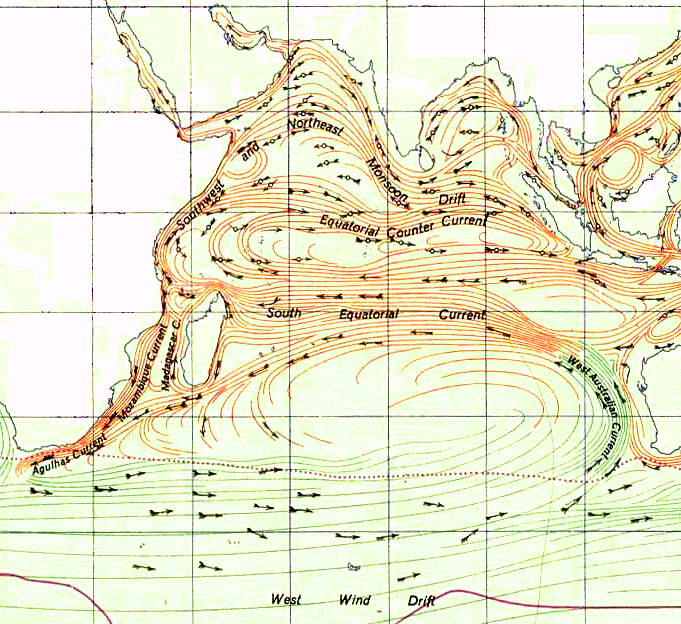 Another depiction of ocean currents. Thanks Severe Clear, that Telegraph article shows a diagram of a B-777 flaperon next to a photo of the flaperon. Looks convincing. Just wondering: assuming (big if) it can be traced to mh370 - would that give us any further clue as of where to search the aircraft, except somewhere in the Indian Ocean?! It would seem to indicate that the search is probably in the right general area. As mentioned above, the current from that area should eventually take any floating debris through the area where this was found. Beyond that, I'd imagine the variation of current and debris behaviour is so large that you couldn't really improve the accuracy of the current search. Edit: I guess one possibility is that the damage might help determine how the aircraft hit the sea, which might help reduce the search area. For example, whether it hit in an uncontrolled impact, or whether it might have been flown down by someone in the cabin. One of the big issues for the search is not knowing how far from the final 'ping' the aircraft might have flown before it came down. Last edited by MG23; 29th Jul 2015 at 18:52. If I was a betting man.. I would be putting my money on South African Airways Flight 295. The piece looks way too short to be a flaperon from a B777. From the second photo in Telegraph article, it's at most 2.5 m long. B777's inboard flap is at least 5 m long. Either it got snapped in half (doubtful, since both edges look straight), or it's not from a 777. Yemenia's Airbus 310 flap would be closer in terms of dimensions. 295 was almost 30 years ago.. That piece of wreckage did not stay that long in water! Based purely on rough approximations from pictures of 777s, it looks about the right size to me. The flaperon appears to cover less than 1/10 of the length of the wing, which puts it under 3m long. Also, from the damage, it would presumably have to be composite rather than metal? That might eliminate some other possibilities. This piece has been a maximum of 2 years in the water. Ressemblance to the drawing is indeed stunning. Still doesn't help us get closer to the CVR, FDR and cause. Agree it doesn't help locate FDR or CVR but it would put to rest at least some of the conspiracy theories.